Children need to learn to read and write properly when they reach elementary school age. Electronic writing tablets for kids are fantastic learning tools that teach children not only their ABCs but also how to properly write letters. With writing tablets, children write letters on a screen and a voice tells them whether they have written the letter properly or whether they need to try again. In this section, we compare two writing tablets for kids that we recommend. Our first choice is the LeapFrog Scribble and Write (ages 3-5). What we like about this electronic toy is that it has various learning modes (depending on your child's age and how advanced he or she is). The lower modes simply teach the child how to use the stylus and draw basic shapes, while the higher modes teach children how to write letters and numbers. Kids learn to write in lower and upper case letters. We also like the fact that the device is so interactive! Kids get feedback on their writing, practice, and learn to improve on their writing. Overall a FANTASTIC fun and educational electronic toy. Tablet #2: VTech Write And Learn Touch Tablet Our second recommendation is the VTech Write And Learn Touch Tablet (ages 3 to 6). What we like about it is its design with letter buttons with animal shapes and a design that makes it easily portable. We also like the fact that children can either use their finger or the stylus provided. Just as with the Leapfrog tablet, it has many modes (5) that increase in difficulty as children progress in their learning. It also gives feedback (it says "great job" when the letter has been traced correctly, or "try again" when it hasn't). 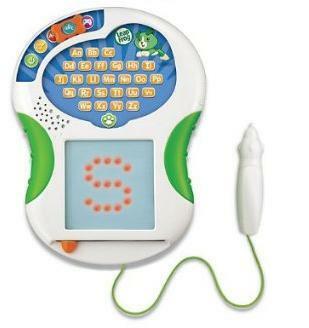 On the negatives, this electronic toy only teaches letters and not numbers.